This 1939 Waterman 5116 Ink-Vue Demonstrator (rare) with Amber celluloid barrel and Black cap with gold-filled trim. The lever hinges in the middle and is then pumped several times to completely fill the barrel. 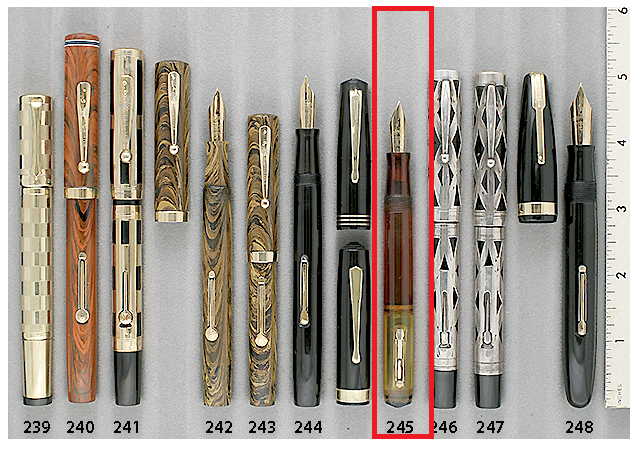 The Ink-Vue demonstrators were Waterman’s answer to the Parker Vacumatic. This speciman has a few dings in the plastic, but is otherwise near mint. Two available: (1) Medium nib; (2) Medium nib with a tad of flex.